Yes my Uncle was a miner, named Albert Wilson, aunts name was Francis, she has been dead qute a few years but Albert is still plodding on. He must be 80 ish now. I still see linda on occasions. Brilliant , small world hey . i told my Mother and yes she remembers the names now , thanks . This﻿ is showing around 1915-20. What you notice is that the street layout back then is identical to the way it is today. Well, you learn something every day! Just noticed this. 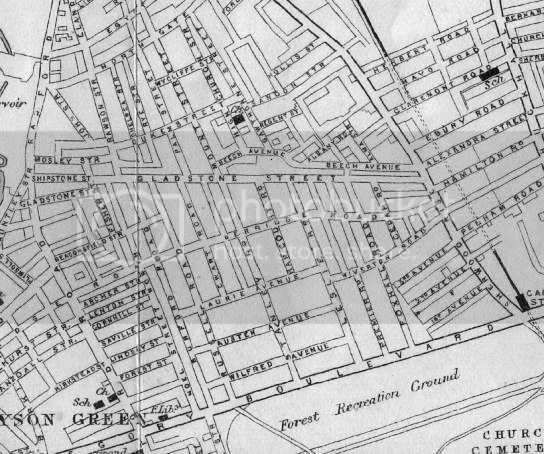 It would appear that, prior to the building of The Manning, there was housing running across the site...Wilfred Avenue...and Stanley Road ran right down to Gregory Boulevard. I had no idea.